Offering bandwidths from 600 MHz to 6 GHz, RTO2000 oscilloscopes excel at both time domain and frequency domain testing. Thanks to excellent signal fidelity, responsiveness of 1 million waveforms/s and up to 16-bit vertical resolution, you can measure quickly with confidence. The capacitive touchscreen with SmartGrid makes this oscilloscope easy and intuitive use. precise and reliable contacting of signal lines. low loading on the DUT is crucial or when the measured signal contains high-frequency signal components. the oscilloscope when measuring with multiple probes. detect sporadic signal faults lightning fast. option and the R&SВ®ScopeSuite software. 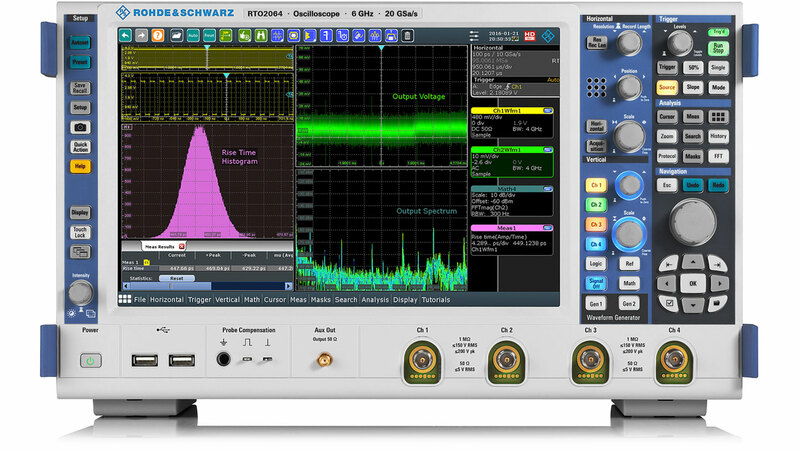 R&SВ®RTO digital oscilloscope, the R&SВ®RTO-K22 option and the R&SВ®ScopeSuite software. USB2.0 test fixture set for optimum contacting of the DUT. Trade names are trademarks of their owners. Always read through and comply with the following safety instructions!